Stainless Steel Three Drawer Trolley supplied by us are procured from reliable sources and companies. 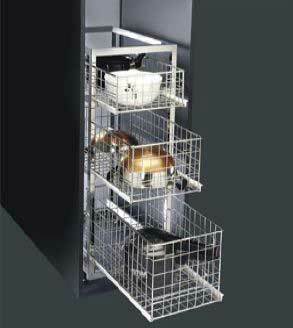 The Three Drawer Trolley is made from superior quality stainless steel. The Three Drawer Trolley is provided with a roomy shelf and a stainless steel towel rail. The trolleys are fitted with heavy duty lockable casters and are fully assembled as well. The Three Drawer Trolley is available in different sizes and attractive designs for safe and convenient storage of essential kitchenware.